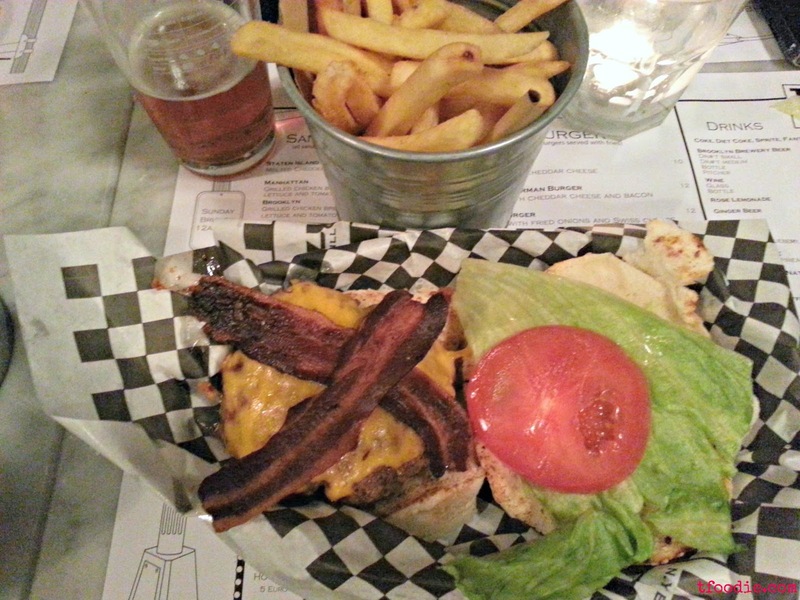 After reading about Tizzy's Bar & Grill's burgers on some local blogs, we tried them for a friends gathering. 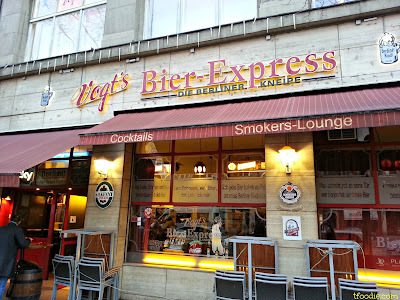 Perhaps it was the high expectations of what has been called "the best place for burgers in town" (Milan, by the way) but I was disappointed. The place is packed every night, but in Milan's Navigli area, that's not a synonym of good food or quality, it's just that that's the party area and everyone wants to be in any of those places, without even caring about the quality or the prices of what they're eating/drinking. The decor is nothing special, anonymous black furniture on white walls. Model-like waiters and waitresses who lack simpathy (especially after they keep asking you every 5 minutes if you want coffee so they can kick you out, but keep forgetting the beer you ordered 20 minutes earlier) and a menu that consists of 10 burgers (with simple ingredients - no special meat), 5 sandwiches and 5 salads. The burgers are good, but not that good, the extra ingredients you order (like jalapeños) are super tiny and over-charged. The best thing were the fries, which come with every order, in a tin bucket. So, in my humble opinion, this place is over-rated, over-priced and I'm sure there are better places for a burger in town -just to name one, Milano Bakery's burger brunch was way better (not to mention cheaper - including the buffet). Mustafa's kebab, worth the wait! What's Berlin's typical dish? Eisbein? Currywurst? No, you're wrong, it's kebab! We all know (if you don't, then pretend you know) that Berlin's Turkish community is a very large one and it introduced this typical Turkish dish -with some variants to suit European taste- to the point that it's now a 2.5 billion Euros business in Germany alone. Last time I was in Berlin, I focused on the touristy things to do and just had schweinshaxe and sausages to eat, but this time I did my research. After a 90% of the blogs, forums, websites, etc. I lurked on told me that Mustafa's Gemüse Kebap was the place to go for the best kebab in town (and, presumably, the world) I decided to give it a shot. Everyone talked about the one-hour queues in the cold or rain to get a kebab but I thought they were exagerating, I mean, who waits in line for that long? We did! and not for one but almost two hours! 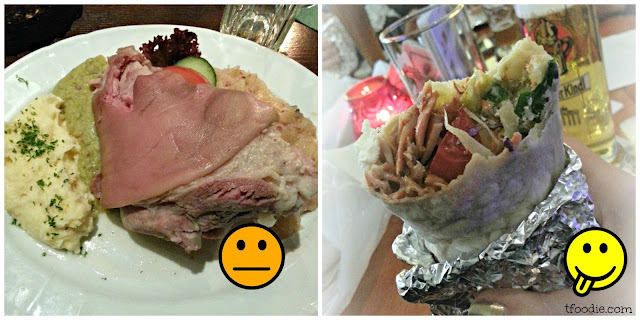 At some point I even thought that maybe it was all a big hoax and the kebab was not even that good but it was just famous (as other tourist traps or over-rated restaurants) but I'm so glad we waited! 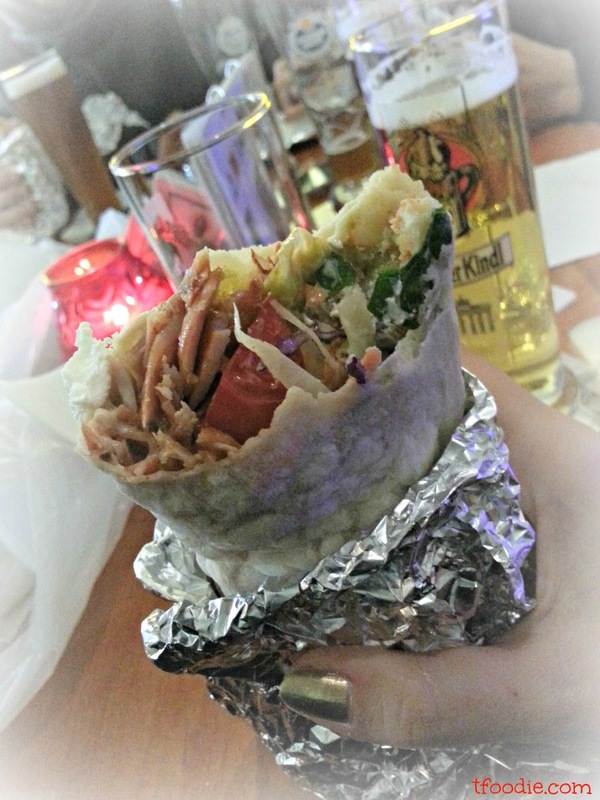 Here's how it went: we were in Berlin with a group of other 7 friends and we arrived at Mustafa's street stand in Kreuzberg on a luckily-not-rainy Saturday afternoon, hungry and a bit tired after all the sightseeing. 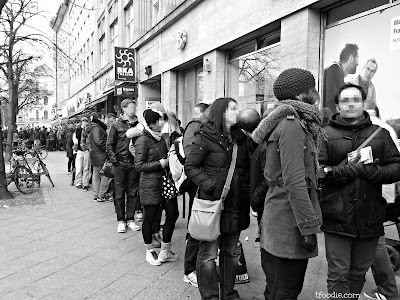 When we saw the 50 people queue we thought twice (the other option was the equally famous Currywurst place - Curry 36 - in the same block which had the same queue length) but still decided to give it a shot. After some minutes some of us went in the neighboring bar to use the bathroom... and came back with a cold beer. This was the begining of a fun afternoon, the bar people told us that we could go in and eat our kebab inside (as long as we were drinking), so we took turns and while a part of us were in the line, the other part would stay in the bar having a beer, watching the soccer game and keeping the table. After almost 2 hours and several beers the kebab finally arrived. And it was amazing! Mustafa's kebab is made from chicken (opposed to Copenhagen's Shawarma Grill lamb), it has 3 different sauces, salad, peppers, onion, feta cheese, lemon juice and other ingredients which combined give it the greatest of flavors. A dürüm was enough for 1 hungry medium-sized person but, since you're there and you've made it through the hour long queue, perhaps you should consider ordering a second one to share, just in case. I would definitely queue here again for a delicious kebab, but I would go with a group so we could take turns between the line and the bar, and I would check the weather forecast before going, it surely wouldn't be funny to queue under the rain. 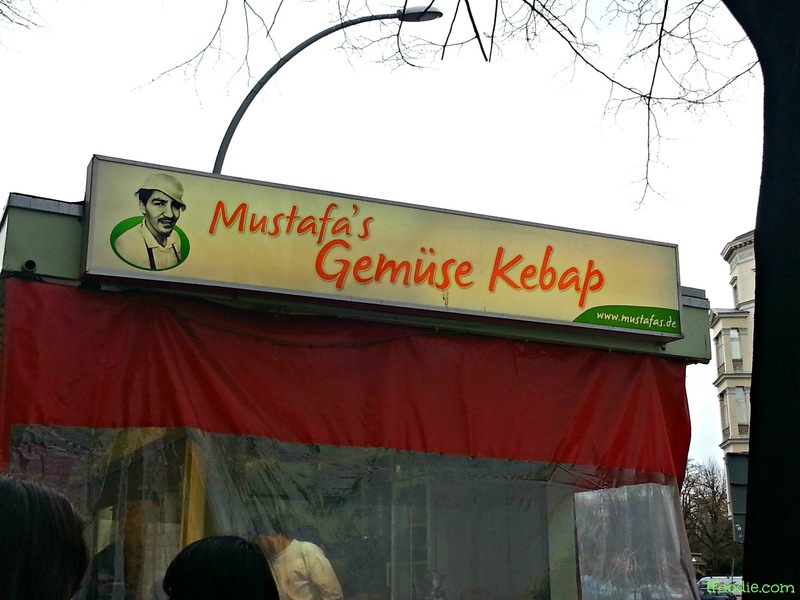 Note: for some months there was another Mustafa stand in Mitte (more precisely, by Monbijou park on Oranienburger Strasse) but unfortunately it has closed so the only place you should queue at is this one in Kreuzberg.